Sometimes it bothers me that I’m married to such an avid hunter. How can he look into the eyes of a beautiful piece of nature, only to pull the trigger and watch it die? But then I wonder how I can waltz out of Costco with a cart full of chicken thighs and hamburger patties, without giving a thought to the animals who sacrificed their lives for our future meals. Which is worse? If I were the animal, I would prefer the wild life ended by a hunter to the lack of life in a feedlot. 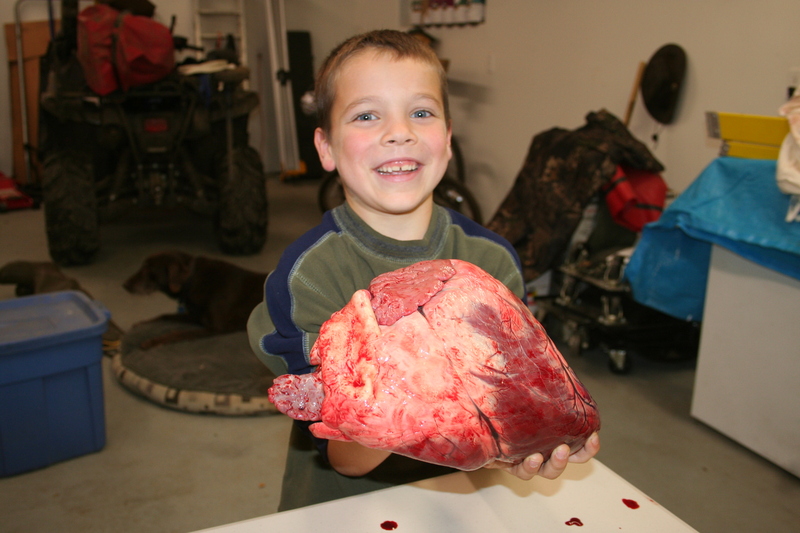 But I can’t bring myself to hunt; it would take an extreme circumstance for me to kill an animal. Yet I eat meat. It is one of the greatest hypocrisies of my life. Truth be told, I slant vegetarian. My weakness for breakfast sausage aside, meat is never a major player in my ideal meal plans. I prefer veggie pizzas, sauces, and soups. My husband, on the other hand, is a carnivore. A meal just isn’t a meal without a powerful punch of protein. We can hardly split a pizza these days because his pepperoni just doesn’t mesh with my mushrooms. So imagine our shock when we received a call from the Alaska State Troopers late Wednesday evening. A moose in midtown Anchorage, on the University of Alaska campus, had broken her leg. Troopers had to put the animal down, and the meat was available. Did we want it? 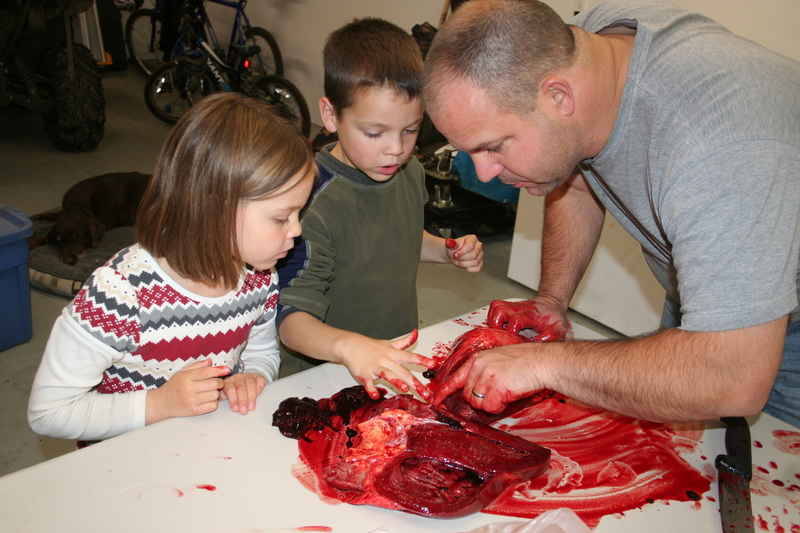 Road kill moose have always been donated to charity, but these days there are more moose than non-profit organizations willing to do the dirty work. As a result, state troopers now take applications from private citizens who are willing to harvest moose killed on local roadways. It sounds extremely redneck, but it really does make the best out of a horrible situation. We don’t know exactly how this moose cow was injured, but her leg fracture was severe enough that troopers were called in to put her down. The dispatcher had been calling people on the list for over an hour, and no one was interested in harvesting the animal. Admittedly, it was a big responsibility. Butchering on site at the campus was forbidden, so she would have to be transported to another location. 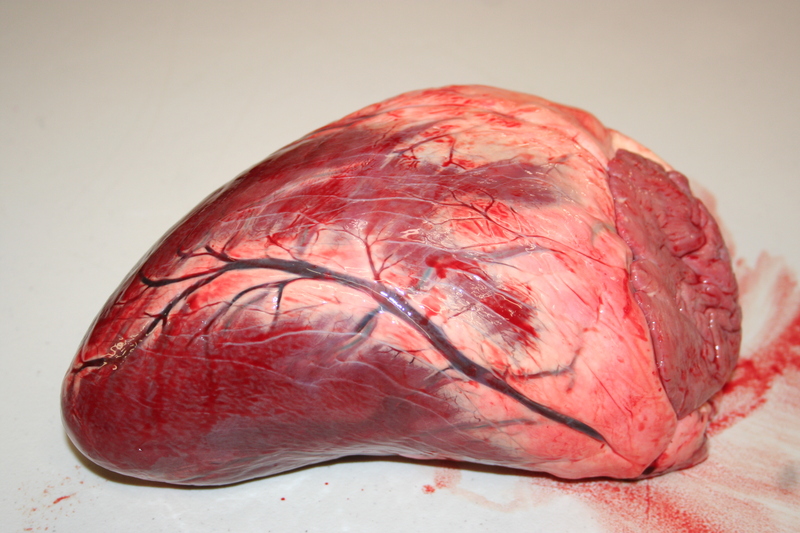 Failure to properly dispose of the carcass and entrails would result in a fine. Clark desperately wanted to say yes, but he couldn’t do it alone. He begged the dispatcher to give him 10 minutes, and began to frantically make calls. He arranged for a trailer and assistance, and almost instantly the plans were in motion. 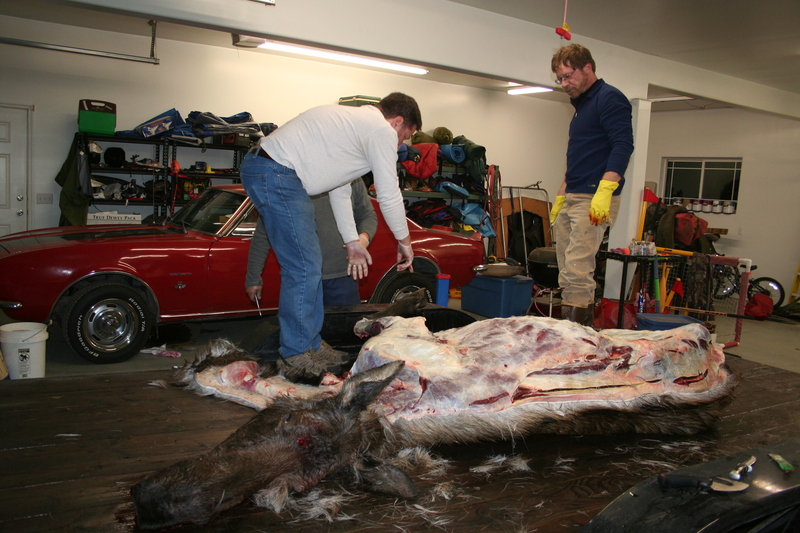 Within an hour – and probably 3 hours since the moose had been put down – the guys were on their way to save the meat. 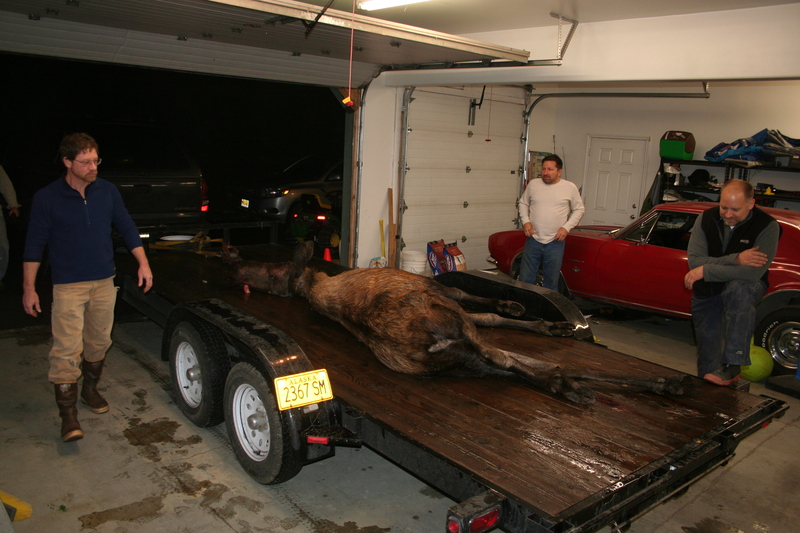 The plan was to use a winch to load the moose onto the trailer, and then drive to the woods for the butchering. But it was dark, raining, and (as usual these days) windy. The guys decided to come do the dirty work in our garage. I wasn’t sure how I’d react to seeing the dead animal. The first time I caught a salmon, I burst into tears when Clark pulled it from the water and bludgeoned its head with a rock. I grew up on an acreage, but I was the only person in my family who couldn’t chop the heads off the chickens. I guess I prefer to wear blinders as I run the circle of life. But knowing there was a 900 lb. moose cow in my garage, I had to at least take a quick peek. I got out of bed and was both cautious and curious as I crept downstairs to see if the guys needed anything. I expected to be overwhelmed with pity and stay for a few polite moments before returning to bed, leaving the guys alone to do to the bloody chores. But I was fascinated, and just couldn’t leave. To see her hooves up close, to look at the thickness of her hide, and to learn about the anatomy of that awesome animal was incredible. 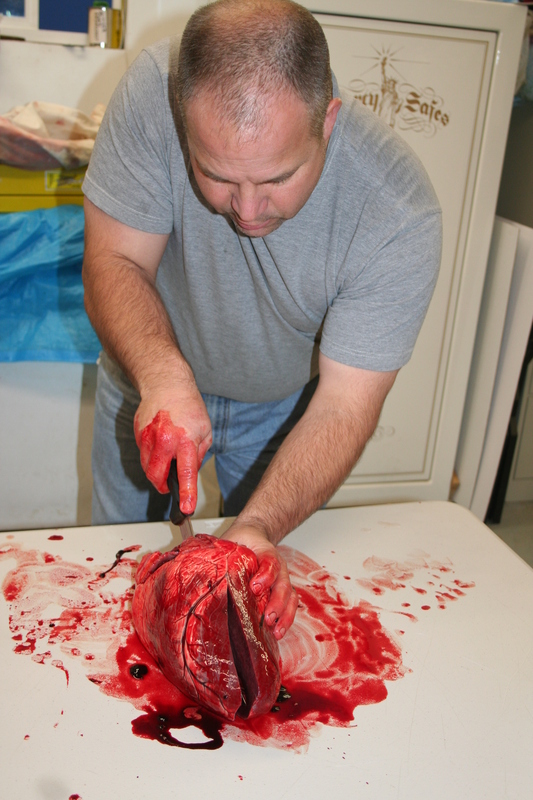 I didn’t roll up my sleeves and get bloody, but I did hold open the game bags and fetch the knife sharpeners. That’s not to say I didn’t feel sad, knowing that this animal’s life had been cut short. I wondered how many times she had given birth, how she suffered the compound leg fracture, and how she fared during last winter’s record snowfall. I wondered about the trooper who had shot her too, if it was difficult for him or just another day’s work. I had a hard time looking at the bullet wound between her open eyes, knowing it was responsible for snatching her body from the world of the living and sending it to the realm of food. The guys were efficient, respectful, and diligent with the animal. Their talent and teamwork was impressive. They worked until after 3 AM. We tried to get the kids out of bed to see the process, but they were in deep sleeps and not easily roused. Clark saved the 6 lb. 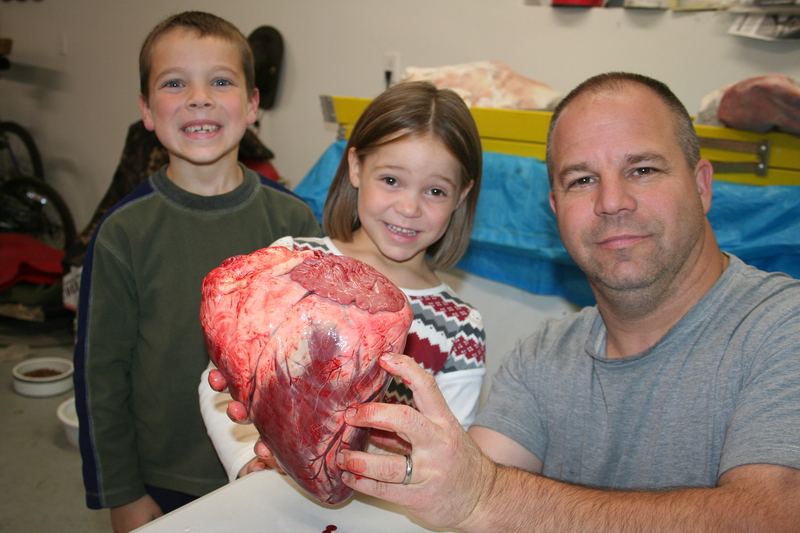 heart, and the next evening he gave them an anatomy lesson. I wish they could have seen the entire animal, and not just the heart, so they could more fully understand the serious sacrifice that had been made. 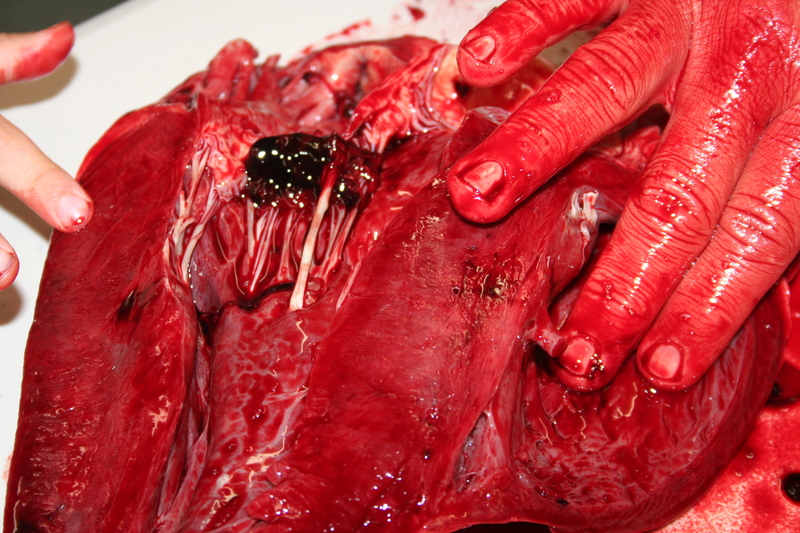 It was a massive muscle, with four enormous chambers and dozens of visible veins and arteries. No science books necessary. 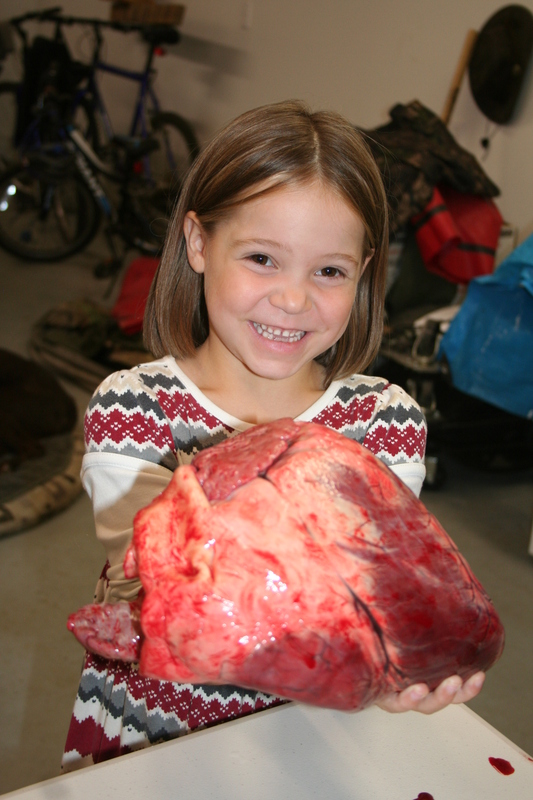 This moose gave hundreds of pounds of meat that will be shared by four different families. Because I witnessed her harvest, I will remember that each time she is part of our meal. I know Clark will continue to hunt, and someday very soon the kids will have the option to join him. He will teach them about gun safety, field dressing, and how to keep a clean camp. But I hope he brings his lessons full circle, and also teaches them about gratitude. To respect the animal, and give thanks for its sacrifice. Staci, what a wonderful story. Felt like we were there….you need to write all the time.